If you’re concerned about air purifier costs you may be wondering if you can even afford one. Or maybe you simply want something affordable that actually works well. Where to begin? 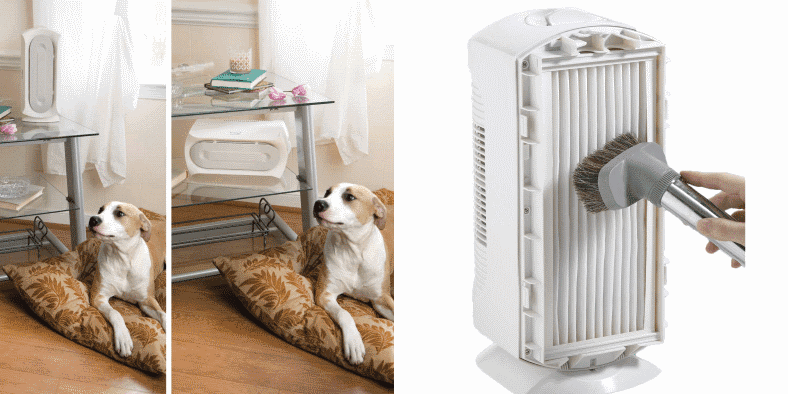 In order to help I’ve put together a list of 5 of the best inexpensive air purifiers. You’ll find the features, a brief reviews, and the pros & cons for each. Wondering how air purifiers work and which kind are best suited for you? There’s a buying guide and basic information here to help, too. 2. How effective are HEPA purifiers? 3. 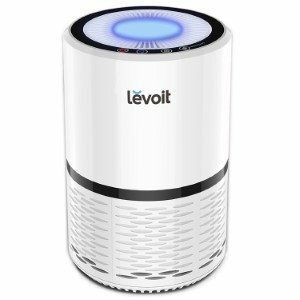 Which type of air purifier do I need? Left: An O-Ion B-1000 ionizer. Right: An ozone generator. Ionizers are a type of air purifier that uses electrostatic charge to collect airborne particles on plates, removing them from the air. Some also have filters to capture dust & particles. 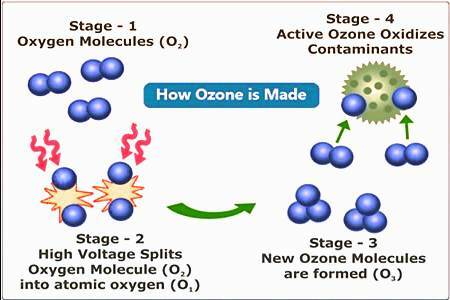 Ozone generators are sold as air purifiers as well, but don’t effectively clean air. Ozone also can be irritating to your internal passageways and potentially harmful at higher levels. As I go into more detail in my post here, ionizers work by generating electrical charges and using plates and/or electrodes to affect air particles. A fan is used to move air through the purifier and as it does, airborne particles get a charge and are attracted to plates of a different charge, trapping them. Some models have reusable or replaceable filters. Others may include additional features like an activated carbon filter to trap odors or an ultraviolet light (UV) germ killer. One unique property of ionizers is their ability to act as air sanitizers and kill sickness-causing germs. When compared to filter-based (HEPA) air purifiers, however, they can’t quite compete. I’ll cover that below. 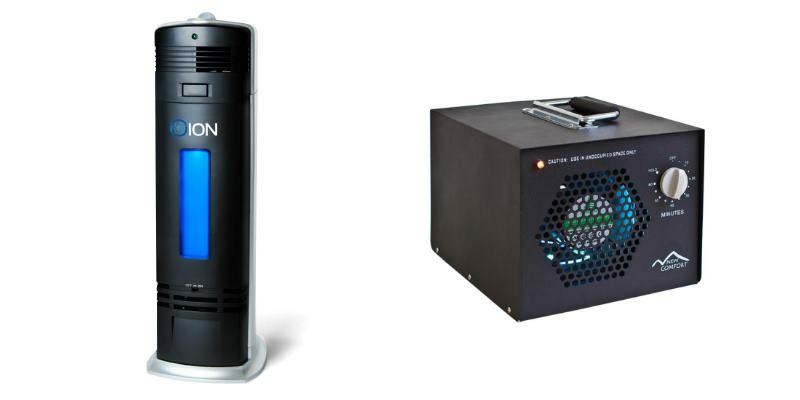 Ozone generators work by using a high voltage corona effect to create ozone molecules. Ozone is the funny smell you may remember sensing outdoors after a lightning storm or from a electric train or car sets. It is generated from voltages change oxygen molecules. The main principle behind it is taking regular oxygen from the air and combining 3 oxygen atoms into an ozone molecule. This molecule has a charge and the atoms 3rd oxygen atom can bond with contaminants in the air. That’s the idea, at least. However, in practice ozone generators aren’t very effective. Some do use filters also, but they’re not very efficient and simply aren’t worth the money. Ozone can be breathed in by humans and pets where it can irritate the respiratory system. It’s especially a bad idea for those suffering from health problems like emphysema. At higher levels it’s also potentially harmful to the human body. Ozone generators are often misleadingly sold as “air purifiers” and while technically that’s true to a lesser degree, they aren’t very efficient as I mentioned. Also, companies often do not include information about the amount of ozone produced, and whether or not they’re safe. I recommend staying away from ozone generators. They’re a poor use of your money! 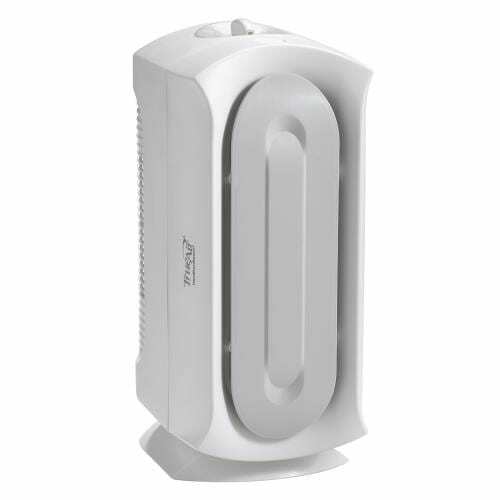 HEPA filter air purifiers like this GermGuardian AC4825 work by drawing air through filters to capture and remove air contaminants. Clean air blows out and back into the room. They work in a cyclic fashion, continually moving and filtering air. Some also include a type of germ-killing feature in addition to an activated carbon filter to remove odors. These work based on a simple but effective principle. Fans are used to move air through very dense type of filter material called a High Efficiency Particulate Air (HEPA filter. They’re very effective and are safe as these types of purifiers don’t emit anything into the air you breathe. 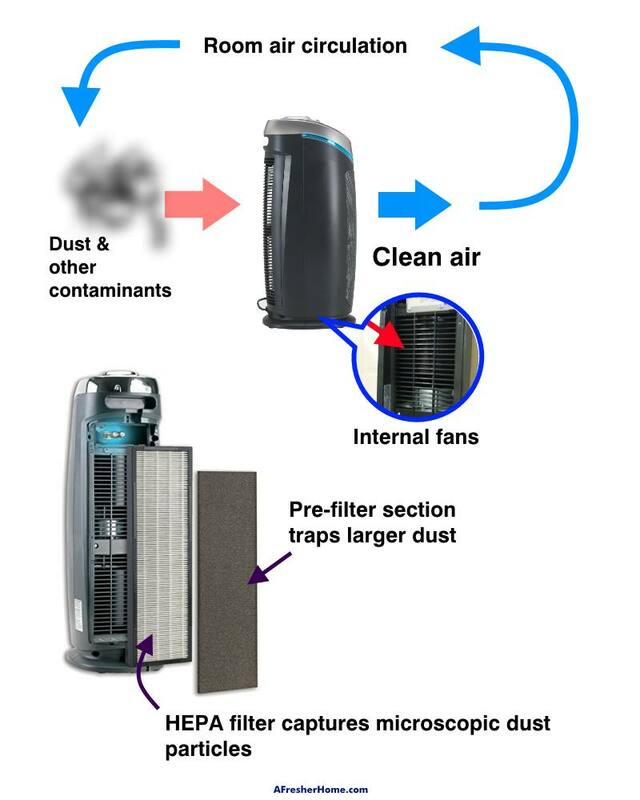 Additionally, many have additional features to compliment the HEPA main filter. These are an activated carbon filter to remove odors and chemical vapors and a pre-filter for larger particles. As they continue to operate air in a room is circulated and continually cleaned. As they work very well for common air quality issues like pet allergies & odors, cigarette smoke, dust, and others they’re very popular. Most also have selectable fan speeds and can be used on low for more quiet operation at night. You can also find some with additional bonus features like a germ killer to reduce microbes. 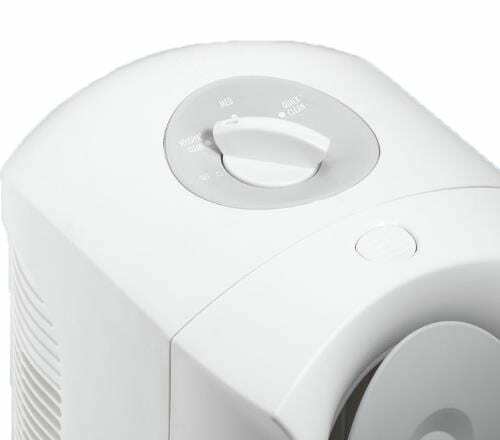 How effective are HEPA purifiers? For reference, 1 uM (micrometer) is equal to an incredibly small 1/1,000,000 of a meter in size! That’s far smaller than the human eye can see. Truly microscopic in size. This is important because with purifiers using “true” (genuine) HEPA filters you’re assured of how effective they are. 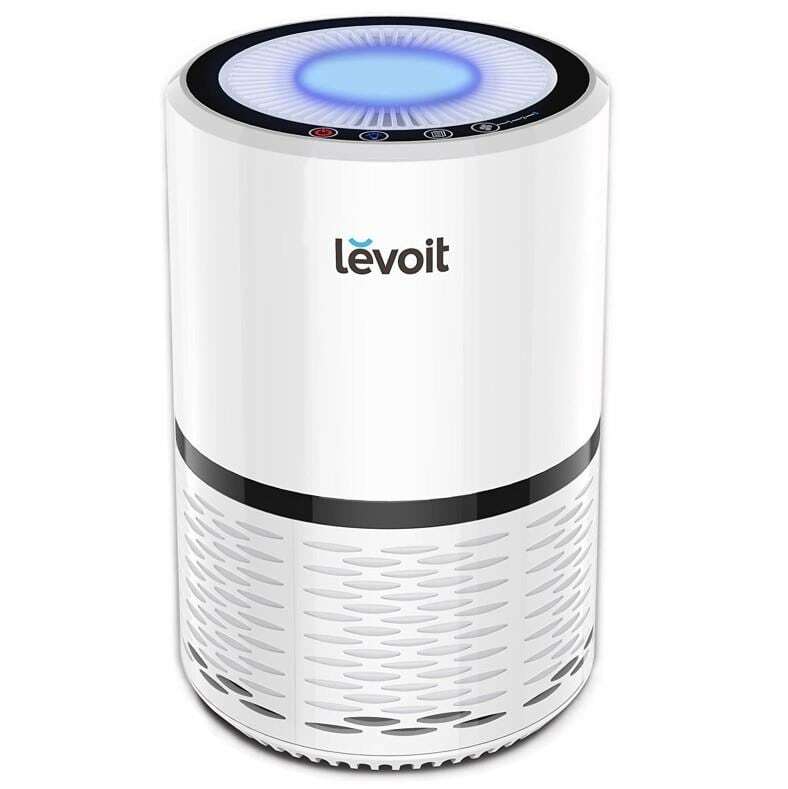 Additionally, many airborne particulates are very small and you’ll have to have an effective purifier that can remove elements those size if you truly want relief. Which type of air purifier do I need? I recommend picking a quality HEPA filter air purifier like those below. Ionizers typically don’t have the proven performance of a good filter based purifier. They also often have a lower fan speed and can’t move air as quickly. 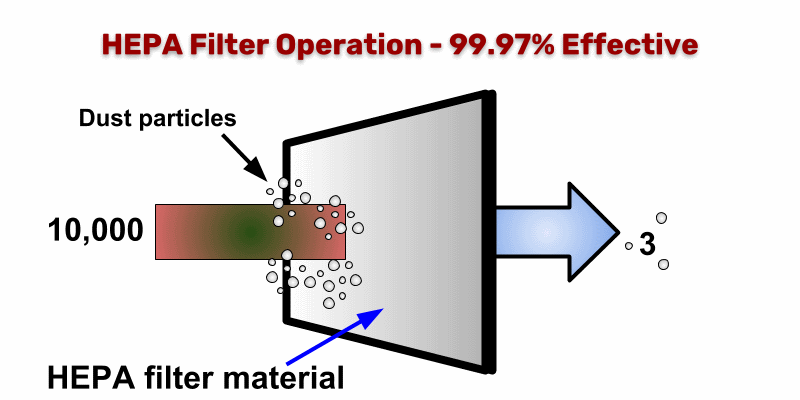 Filter-based purifiers are also much more suited at trapping dust. Models with a carbon filter can definitely help with odors and other chemical substances in the air. I own and have personally tested several below and I can vouch for how well they work! 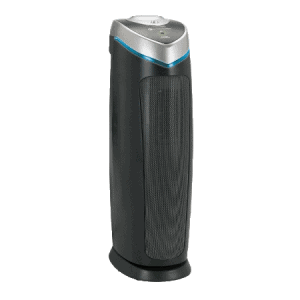 HEPA purifiers have proven, demonstrated effectiveness which is important when buying products like this. You don’t want to spend money on something based on marketing hype, only to find out it’s not helping you.l. 1. 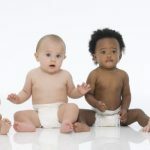 GermGuardian AC4825 – A winner! Best-selling, effective cleaning with good value. As I’m an owner I can tell you why it’s a great choice. 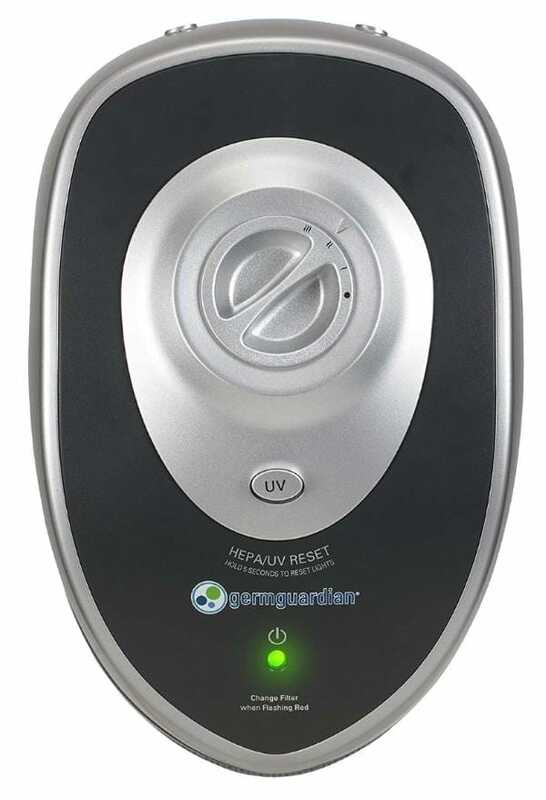 The GermGuardian line of purifiers from Guardian Technologies are some of the best and most popular sold today. The AC4825 is well made and good-looking. A major top seller, this model doesn’t include some of the fancier features like electronic touch controls and so on. However, it makes up for it and is a better overall value as the room coverage, at 155 square feet, is larger than some others for the same price. You also get a great ultraviolet light (“UV-C”) germ killing feature which destroys germs in the internal airflow and in your room as it works. The genuine HEPA filter guarantees you’ll get fresh, clean, and healthy air you’ll love to breathe. It’s a smart choice for relieving allergies, cigarette smoke, and dust. I was amazed how much dust mine removed from the air! The pre-filter and activated carbon filter section captures larger particles and handles odor neutralizing. It’s a great overall value and one of the most sought-after. For additional detail you can read more in my extensive review here. The AC4825 features one of the easiest-to-use control setups you’ll find. It’s incredibly easy to use! Set the rotary control to one of the 3 fan speed settings. Use the UV push button to switch the germ killing feature on or off. A power-on indicator LED lights when the purifier is working. A rotary 3-speed fan control is used to change fan speeds and turn it off. The filter is easy to remove and replace by opening the rear door and simply swapping it out. A filter replacement reminder is included too. The lovely blue trim ring lights up when the UV-C feature’s in use. Don’t worry though – it’s perfectly safe, as the ultraviolet light is trapped inside. It’s a great-looking way to see when the feature is on. I like it! At 22 inches in height, it’s not compact as others but the small base size allows it to fit well in corners. Replacement filters cost about $30 and last around 6 months or longer. You can also find 3rd party brand filters which are often less expensive. Carbon filters can be replaced separately, too. Don’t like the style and look? Great news – there’s also a sharp-looking version called the AC4900CA. It’s identical in performance and features. As a happy AC4825 owner I understand why it’s so popular. It’s well made, works great for cleaning the air, and is frustration-free. I recommend you look for the best price and read the many great reviews over at Amazon. 2. 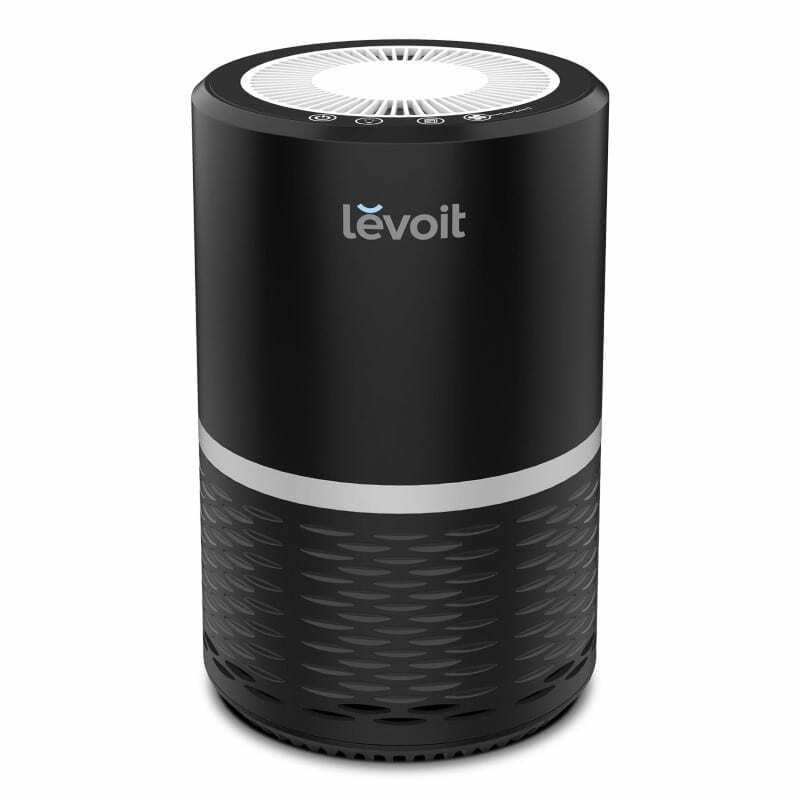 Levoit LV-H132 – Nice features, performance, and a good choice for small to mid-sized rooms. The LV-H132 provides less room size coverage than the GermGuardian AC4825 but makes up for it with a lot of great features. It’s a popular model and best seller. Well suited for small rooms or light duty use in medium-sized rooms. The 3-stage true HEPA filter is great for eliminating odors, allergens, pet dander, dust mite allergens and so much more. Odors are no problem, either. The Levoit LV-H132 is sophisticated yet still easy to use. Electronic touch controls are provided and beep when operated. After power is switched off the last settings are saved. Upon the next use, the purifier remembers your last settings and restores them automatically. Of the inexpensive purifiers listed here it has the most features. 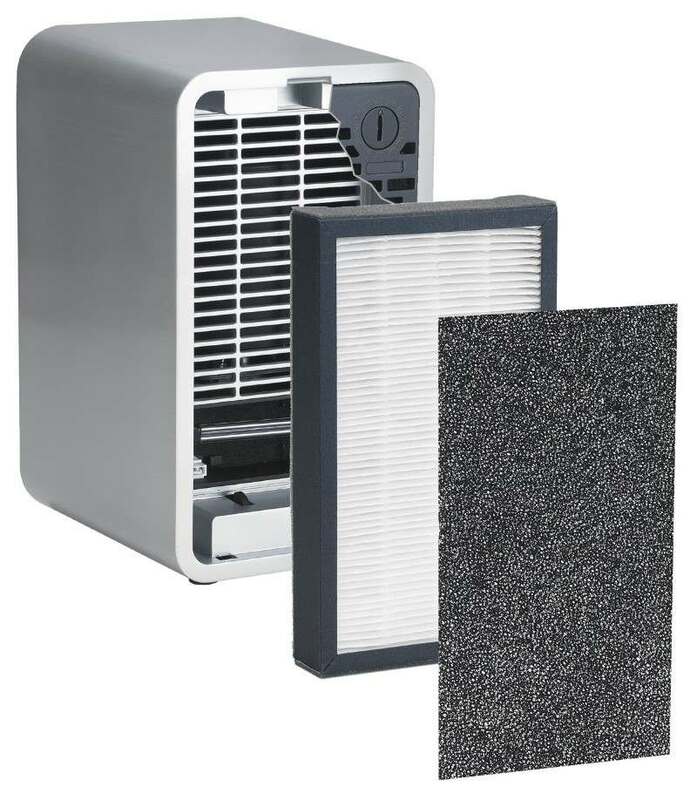 The LV-PUR131 uses a 3-stage design similar to others: a fine preliminary filter, an activated carbon filter, and a true HEPA filter which captures and removes dust very effectively. Sound levels are pleasant and operation is quiet on low speed. There’s also a lovely night light with 2 brightness settings built in. The filter replacement reminder indicates when it’s time to check and change the filter if needed. Filter replacement is a bit different for the LV-H132, but very simple. 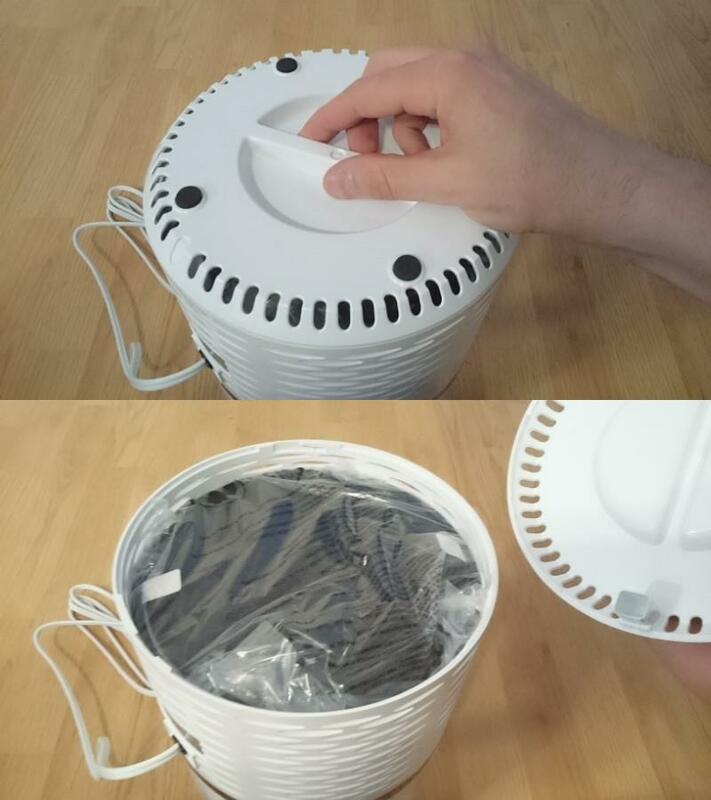 Turn the unit upside-down, rotate the cover, and then you can pull out and replace the old 3-in-1 filter assembly. Note: unlike some competitors, in most cases you can’t replace the carbon prefilter separately. It’s something to keep in mind. Replacement filters run around $30 and are easy to replace by opening the top cover. Of all the air purifiers I’ve owned and tested the LV-H132 had the lowest noise during operation. I was honestly surprised how quite it was! Don’t take my word for it, though. Be sure to check out why it's one of the most popular models and received the Amazon's Choice label. Note: It’s also available in black as well! 3. 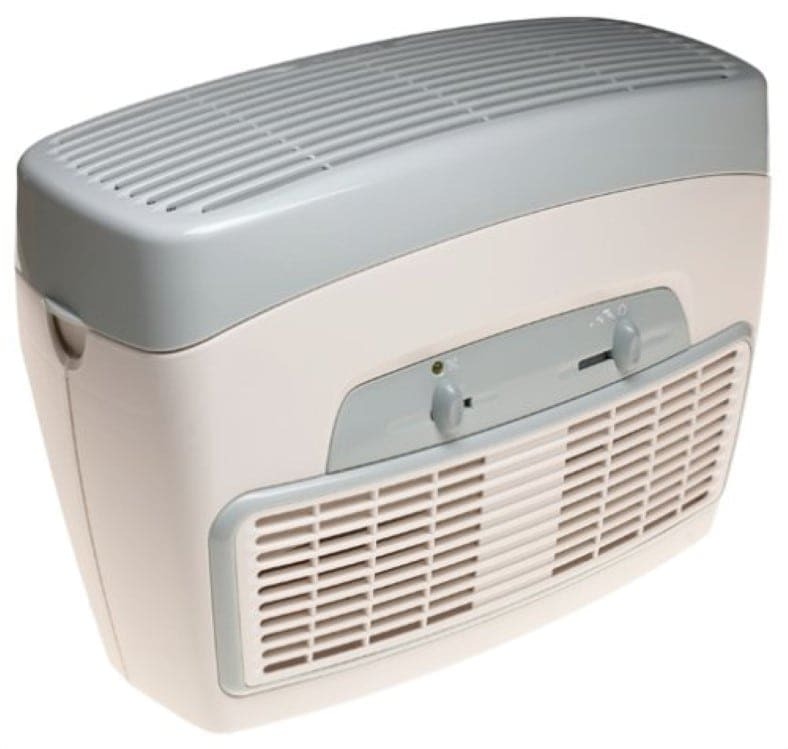 GermGuardian AC4100 3-in-1: Got a small room? Get great performance for less money. Affordable? Yes. Low on quality? No! I’m an AC4100 owner too (yes, I test many different kinds!) and I can tell you it shares the same quality and performance the GermGuardian purifier family is known for. It’s a modern looking, well performing purifier. Measuring only 7.5 x 6.5 x 11″ in size, there’s a true HEPA filter along with a pre-filter/charcoal section to produce fresh, healthy air you’ll enjoy. 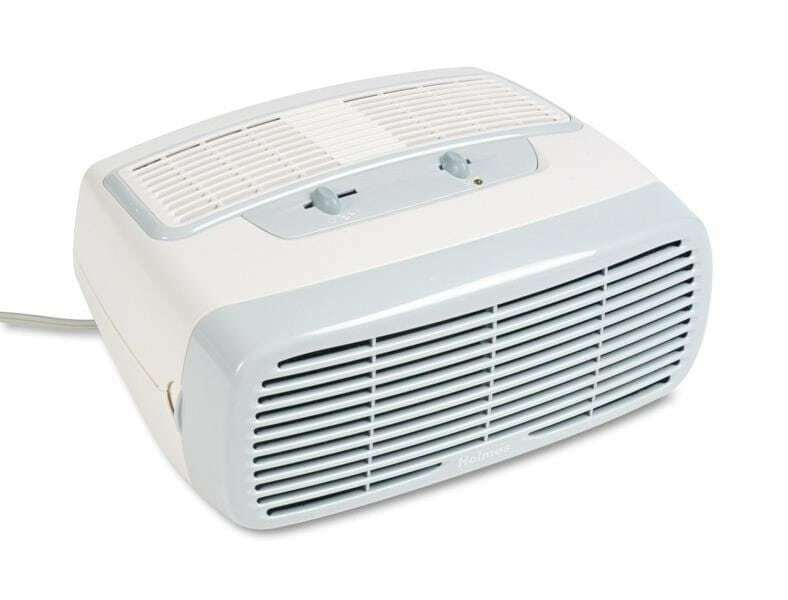 The AC4100 is a great choice for small rooms, dorm rooms, offices, and many other places. Mine works great and it’s a great way to reduce dust if you have problems with it like I do. Filter replacement on the AC4100 is easy! Just open the rear cover, pull out the old filter, and insert the new one. You can also use a vacuum to remove larger particles like dust. As you can see my AC4100 caught more and more dust as I used it! The UV light (along with titanium dioxide) kills germs to sanitize your air and reduce sickness. Replacement filters cost about $18. A filter installation date wheel is available to mark when you installed a fresh filter. 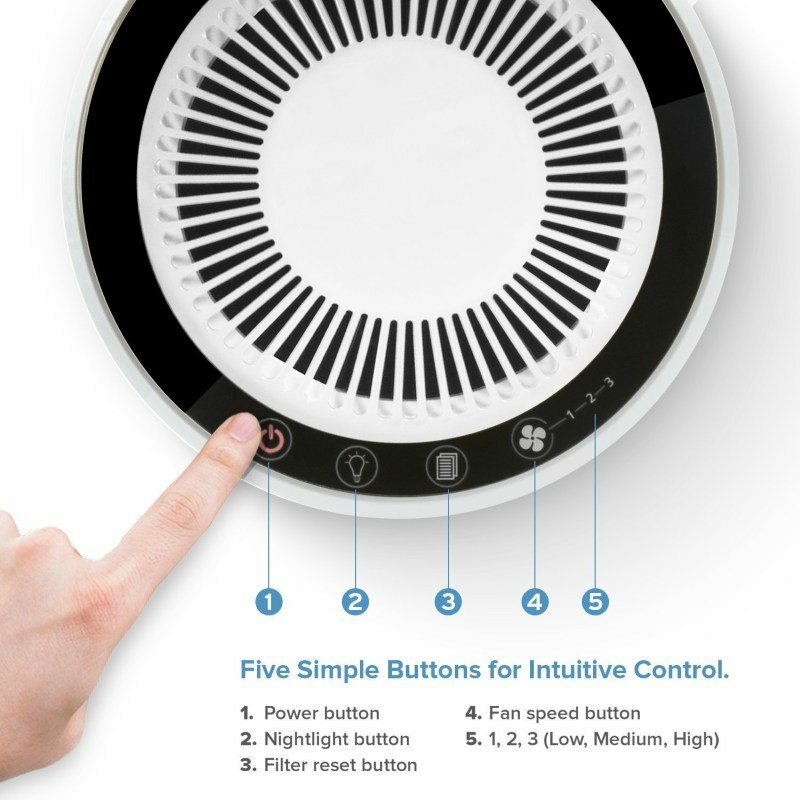 A 3 simple rotary control adjusts fan speed and turns it off. It’s quiet and generates a pleasing low noise level on the lowest setting. When set to high somewhat similar to white noise is produced. It’s different from other GermGuardian models in that the UV-C is an on/off switch rather than a push button control. Also, I’m not so happy that there are no indicator lights for the UV-C feature being turned on or the filter replacement. Those are fairly minor complaints, however. Overall, it’s a great choice for small rooms and I’ve been happy with the ones I’ve owned and tested. The AC4100 provides the same quality that make GermGuardian purifiers some of the best today. I definitely recommend it for both its great value and low price. Be sure to check it out! Head over and see the many great buyer reviews and why it's one of the best-selling affordable purifiers at Amazon. 4. Hamilton Beach TrueAir Ultra Quiet – Inexpensive, compact, and quiet too. The Hamilton Beach TrueAir is not just a well-made purifier that’s with that’s inexpensive but one that also helps keep ownership costs down. 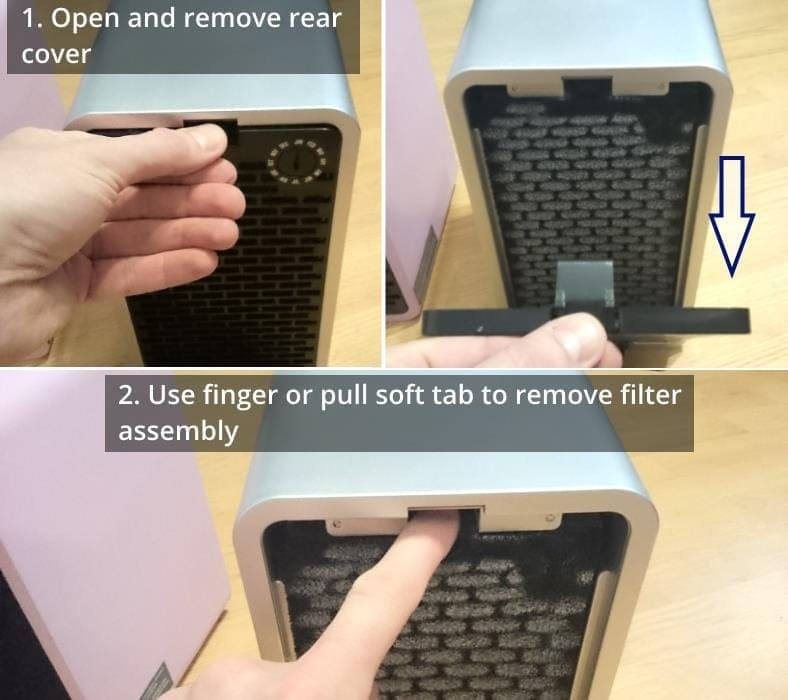 The HEPA filter can be vacuumed clean. Under normal use won’t have to replace it as frequently as you would for other brands. It’s a great way to save money. Operation is super easy! A simple rotary control lets you select the fan speed desired. Operation is simple using the 3-speed fan control. It runs quietly during operation unlike some other products out there. The compact size (8.5 x 13.5″) lets it fit in more spaces. Hamilton Beach rates the room coverage at a nice 140 square feet. Perfect for small to medium sized rooms like offices and bedrooms. The Hamilton Beach TrueAir fits neatly into small spaces – especially shelves – as it can be used on its side. Remove the rear cover to vacuum the filter for extended life. It’s a great way to keep costs down. Another great option it has is the ability to be placed on its side – soft feet keep it steady when rotated. Unlike the others, there are no additional pre-filter or carbon filter sections. I don’t recommend it, therefore, for odors and smoke for that reason. (Note: If you have pets, check out the pet version TrueAir Pet Specialized Cleaner). Color options include both black and white. Note that the different colors may be priced differently from time to time. It’s a nice, affordable option for many people. You’ll be pleased to find out the low price and see the many happy buyer reviews at Amazon. 5. 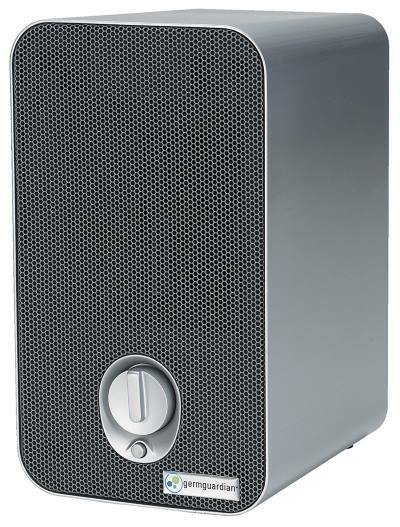 Holmes HAP242-NUC HEPA-type desktop purifier – For the budget minded. Got an even tighter budget and less demanding air quality problems? The Holmes HAP242-NUC might be just what you need. Although one of the cheapest, at 14.8 x 11.4 x 7.2 inches in size it can still provide good air purification and especially a good value. The design makes it great for counter tops, shelves, and desktops. Additionally, the Holmes can also be placed vertically on its back. Rubber feet are built-in on the rear to allow keep it steady when repositioned. As it’s a budget model, the Holmes purifier uses as “HEPA type” filter which features nearly the same filter performance as found on more expensive models. 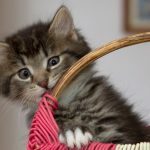 It’s not a good choice for smoke and the most difficult air problems, but for most like pet dander, allergies, dust, and more it’s a good option. It uses a HEPA-type (not true HEPA) filter that is similar – but not quite as capable – as the filtering performance of a true HEPA filter. It can remove 99% of all particles down to 2 microns in size (2/1,000,000 of a meter) vs. the 0.3 micron capability of a genuine HEPA filter. It’s a budget model but still a good performer for many common air quality problems. The 2 micron particle size rating will work for pet dander, dust, and standard alllergens. I wouldn’t recommend it for cigarette smoke, however, at least not without a carbon filter. An optional ionizer is provided and produces a safe level of fresh charged molecules which bond with pollutants in the air to enhance results. The HAP242 is unique in that it can be stood on the end if desired. Soft feet are built into the body to keep it in place and steady. It’s a cool feature I like and it’s a good option for circulating the air more effectively. One unique feature is how pre-stage filter can be removed and washed. Fan speed is adjustable and while not as quiet as the Levoit and others here, it does offer low noise when on low speed. It’s recommended for rooms up to 109 square feet in size. Many buyers on a budget have been happy with it. A few reported finding replacement filters for as little as $13 dollars. For those with tight spending limits it’s a good option. You can find many positive reviews and details here (Amazon pricing is one of the best). 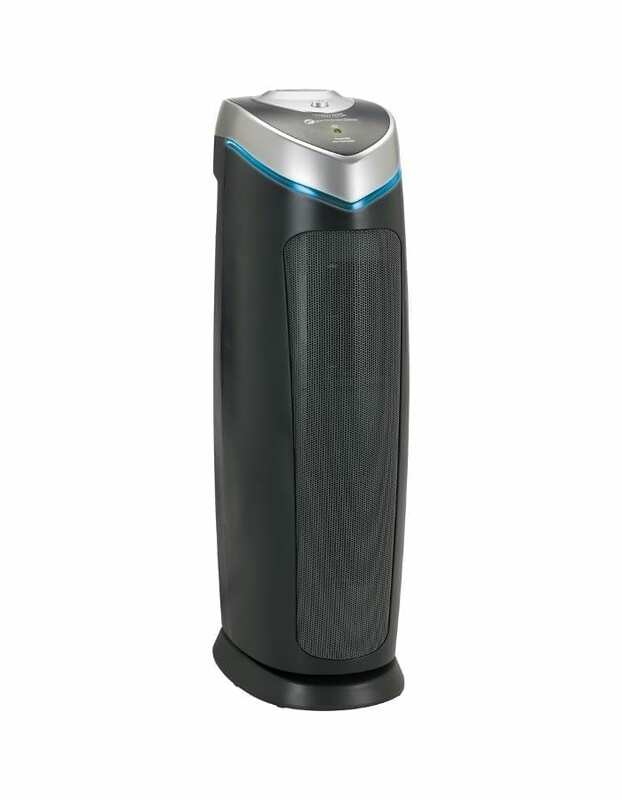 The GermGuardian AC4825 is my top recommended for an affordable air purifier below $100 and it’s often on sale at Amazon for below $80. It’s one of the best values as the room coverage is one of the largest in its price class. The quality and performance are both very good as well. 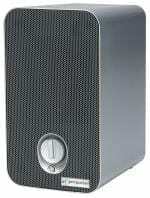 Based own my own testing and as an owner of the AC4825, I recommend it as the best low-cost air purifier under $100. It’s one of the best-selling models in the world, too. 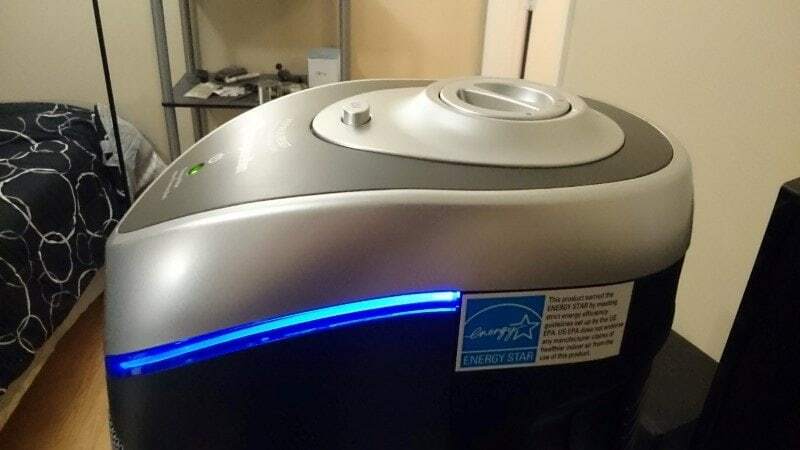 I personally own the GermGuardian AC4825 and was so impressed I wrote a great review here. 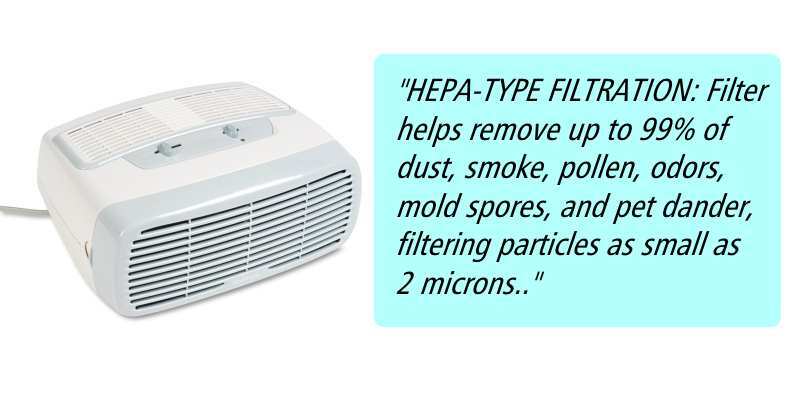 If you’d like to find out more about HEPA type vs. true HEPA filters here’s a great post that explains more. Feel free to post a comment or contact me if you have comments or questions!